This article has been in the works for quite some time and, considering the snail’s pace at which I have been writing things lately, I am surprised I got this wrapped up at all. I have a myriad of excuses: work, crazy relatives, becoming a father again, etc, but bottom line is that I procrastinated way too much on this. In all honesty, this is my fourth High End Tactical article and I got a little bored with fancy scopes. They are a joy to shoot and use, and I wish I could afford any of them, but in the previous article, all of the scopes were ultimately so good, that there wasn’t all that much interesting stuff for me to look at. However, I felt that this article series would be incomplete without looking at the heavyweights of the class: 56mm scopes. I fully expected to breeze through the testing and wrap things up in a jiffy, so to speak. Then I had problems getting my hands on some of these, which was largely resolved. Then I got to actual testing and found all sorts of differences that got my interest up. Then real life stepped in and I did not touch a rifle for several months. This has been a stop and go sort of thing ever since. After all, I looked at six scopes: Steiner Military 5-25×56, Premier Heritage 5-25×56, Kahles K624i 6-24×56, Schmidt & Bender 5-25×56 (two samples) and March FX 5-40×56. 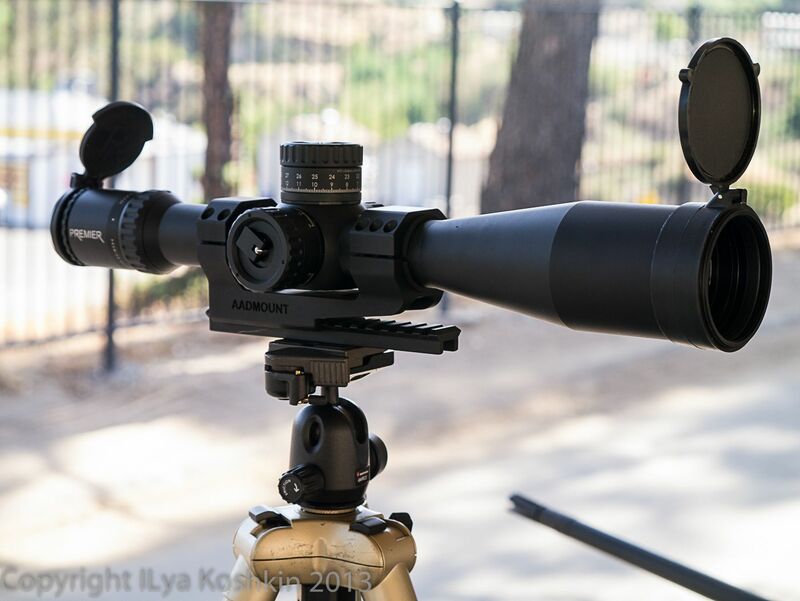 There are other scopes that belong in this group, so I will likely try to do a follow-up if I can get my hands on them: Leupold Mark 8 3.5-26×56 and Nightforce BEAST come to mind along with the Hensoldt 3.5-26×56 if it ever becomes available. Perhaps, USO as well. I am also hoping to see some other scopes that would be interesting to throw into the mix. Lastly, I will need to re-test the Kahles since there were issues with the scope I had (more on this later). Before I go too much further with this, here is my usual disclaimer: I do not test the durability of scopes. I do not try to destroy them. 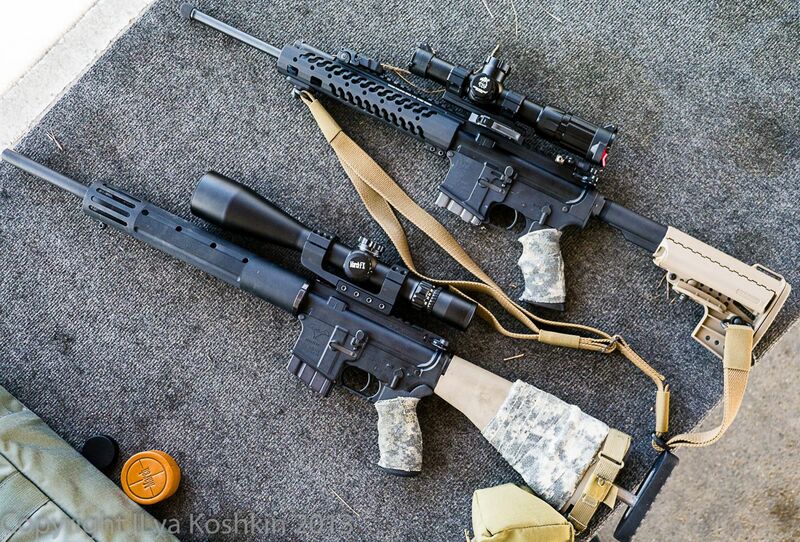 They go through some normal usage in my hands, which is not particularly challenging for heavy duty tactical scopes. I do spend a lot of time twisting turrets and various other controls. The Kahles scope I looked at had optical issues which I presume are specific to the sample I had. I was not able to get another sample quickly enough, so I will have to re-visit this scope. 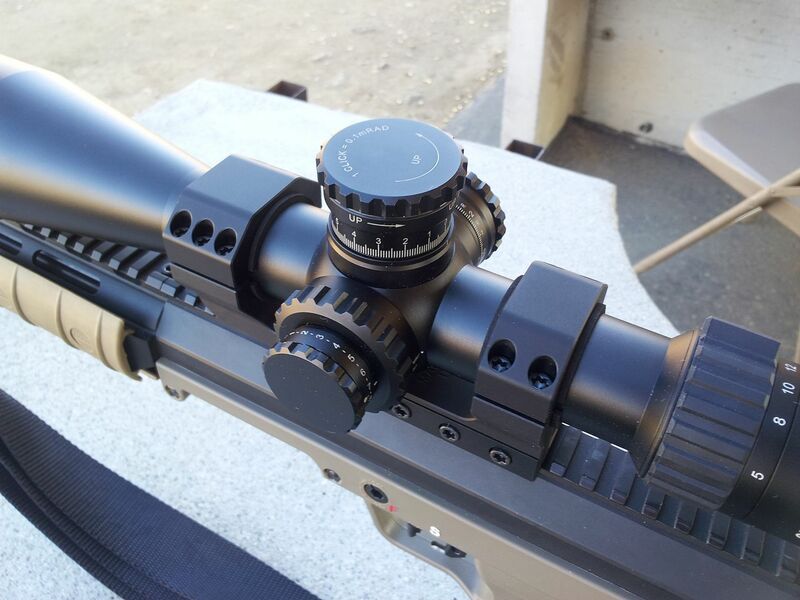 Overall Optical Quality: Premier is the best rounded scope in this group in terms of optics. It is really well optimized across the whole magnification range. Both March and S&B are spectacular once magnification gets above 12x or so. Steiner is almost as well rounded as Premier, but is not as good above 15x or so. Overall Mechanical Quality: Kahles had the best calibrated controls overall. March could have taken the crown also if it was not equipped with 5mrad per turn turrets. Resolution: in terms of ability to see detail far away, March is absolutely stunning. Up to 25x Premier and S&B were as good. However, March can take you up to 40x. That is not always useful, but when environmental conditions allow it…. like I said: stunning. Contrast: Premier and S&B have the best contrast in this group. The image really “pops”. Kahles showed some promise, but as I said before it had optical issues. Steiner was close too. Eye Relief Flexibility: Kahles takes the crown here, but Steiner is quite close. Premier is mid-pack, while S&B and March are pretty unforgiving of odd head positions. Reticle Illumination: All are pretty good. Steiner is probably my favourite in this group: it is well-calibrated and has an OFF position every other stop of the knob. March illumination works OK, but is a little limited. Low Light Performance: these are similar configurations, so there isn’t much to differentiate between them. I think Premier and S&B were better by a nose than the others owing largely to good contrast and widish FOV. However, the differences were small. Stray Light Control: once again all are designed well, with Steiner being more susceptible to flare than the other scopes here and mostly at high magnification. Tracking: March never hiccup’ed at all. Kahles was good. Steiner gave me some odd results during the first test, but tracked beautifully at all other times. Perhaps, it was user error or it needed to settle. S&B’s and Premier did not give me any real issues other than the knobs being a bit stiff. There was a brief moment where I had a hard time evaluating whether single and double clicks are doing what they are supposed to, but switching to another batch of handloads fixed the problem, so I doubt it was the scope. If you were looking for a short(ish) summary. This was it. If you feel brave, let’s see if you can stay awake through the rest of it. First of all, I would like to thank brave companies and individuals who loaned me their scopes to evaluate. The first S&B came from one of the Hide members who wished to remain anonymous. You know who you are and you have my gratitude. I have never been able to get any traction with S&B, so if it wasn’t for people like you, it would never be in my test. The second S&B also came from an unexpected source: Kinetic Ops and their CEO, Ron Evenson, provided one of their scopes to help with this article. Kinetic Ops, among other interesting things, designs advanced weapon systems for the military. Ron is in a different part of the country from me, so I have to make sure to get together with him at SHOT next year. We ended up discussing a lot of my results over the phone and I am grateful for his help and feedback. Premier 5-25×56 came from Paul Lange at Premier. We discussed this at SHOT and one day a scope showed up on my doorstep, no questions asked. 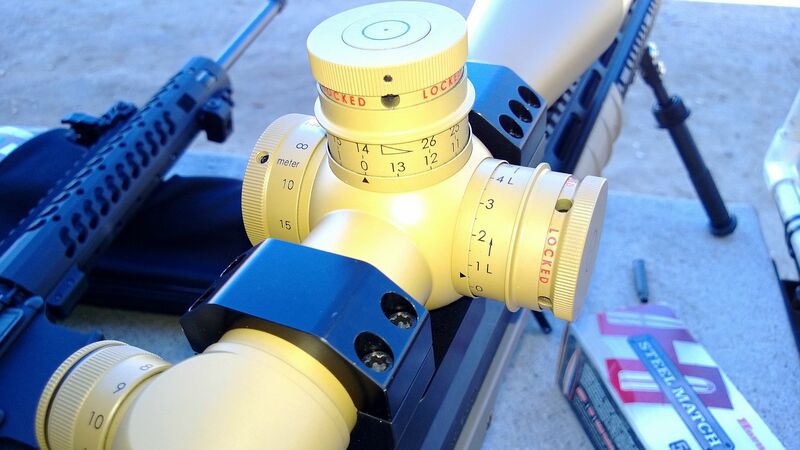 March FX 5-40×56 was sent to me by Jim Kelbly, who imports these scopes to the US. Despite occasional criticism of his scopes, he is still adventurous enough to send me scopes for testing and to listen to feedback. All of the mounts used in this test (except for one of the S&Bs that was in a Bobro mount that came from Kinetic Ops) were loaned to me by Jon Aadland who makes Aadmounts (a couple of them I own, but he loaned the rest of them). One of the S&Bs came from Euro Optics and their house mount was included, but I did not use it. It looked solid enough, but I did not get around to testing it. If you wonder why I almost exclusively use Aadmounts, here is the simplest explanation possible: since I started using them I have not had a single mount problem worth mentioning When I was testing the March one day, I accidentally forgot to tighten all four screws on the mount. Only one screw was holding it to the rail. There was no movement or any other effect on the system repeatability. Once I saw it, I tightened the rest of the screws and re-ran the test. Same results (within the limitations of my shooting). Does that mean Aadmount makes the best mounts out there? Not necessarily. This is a game of confidence, and I have confidence in these. There are a lot of good mounts out there, but I do not have nearly as much mileage with them. That having been said, I am slowly switching all of my Picatinny mounts to Aadmount designs except for QD applications, where I like Bobro. In terms of overall weight and size all of these scopes are eerily similar to each other. Some are a little lighter (Kahles and March) and some a little heavier, but they are all close and they are all boat anchors. The only notable difference in specs really is that S&B and March focus down to 10 meters or so which makes them suitable for precision airguns and rimfire rifles. That is not my thing, but there is clearly a market for it. Also worth noting is the field of view difference. March has the narrowest FOV of the bunch, which is generally a trade off for the wide magnification range, comparatively slim eyepiece and long eye relief. Kahles has the widest FOV here with the rest in between. Looking at the adjustment specs, March clearly marches to the beat of a different drum. 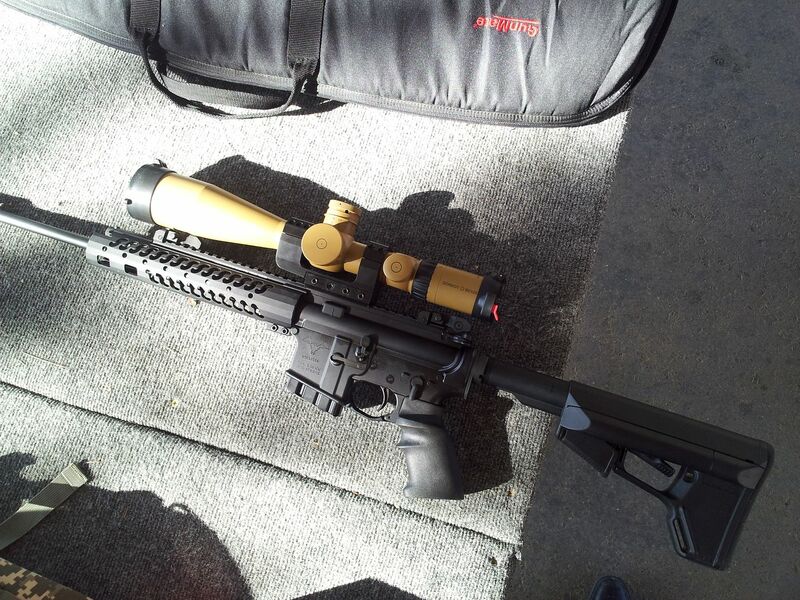 It has a much wider magnification range, 0.05mrad clicks and 5 mrad per turn adjustment. The turrets are the same style and size as the 3-24×42 I reviewed earlier, but with finer clicks. Overall, mechanical feel and quality of every March scope I have seen to date is absolutely stunning and this scope is no different. The zero stop on the elevation turret is the most user friendly ZS design I have seen to date. I also like the fact that the knobs do not stick out as much as they do on the other scopes here. The rest of the scopes in this group are clearly trying to give you as much adjustment per turn as possible. I am not at all convinced I am a big fan of this trend, although this is all subject to execution (interestingly, I used to really like scopes with a lot of adjustment per turn, but slowly drifted from that over the years). I look at a lot of scopes every year, and I can’t help but develop some personal preferences for turrets and to me, going for so many clicks per turn sacrifices feel more than I am willing to accept, unless the diameter of the knob becomes progressively larger. For example, I remember looking at the new Hensoldt scope at SHOT which had 18mrad per turn (or something along those lines) and being very impressed until I checked the feel of the knob. I am sure it is well designed and repeatable, but as far as feel goes, that turret is not going to win any contests (or get out of the qualifiers for that matter). The situation is also somewhat exacerbated by the fact that these are all tactical scopes and the tension in the turrets is often set high enough to make sure it does not inadvertently move during transportation. The combination is all too often not very user friendly. The scopes in this group manage to pull it off with varying degree of success, but more on that later. For the record, off the turrets I have seen over the years, good 10 mrad per turn designs with 0.1 mrad clicks seem to have the best combination of feel and range overall. For my preferences, 5 mrad per turn is not quite enough. Also, 0.1 mrad clicks seem about perfect. I do not think I can shoot better than that with any consistency anyway. Holding the POA to 0.05 mrad is quite beyond me. If you ignore everything else, in terms of pure feel, March easily has the best calibrated turrets here, but it is hardly surprising since it only has 100 clicks per turn vs 140 for S&B, Kahles and Premier, and 150 for Steiner. Of the two S&B scopes, the first one I got my hands on was brand new straight from the dealer, and the turrets were very stiff. When that stiffness was combined with the MTC click stop, I found it virtually impossible to go one click past the MTC. I spent a fair amount of time with that scope, and I do not think I ever managed to get confident with adjusting the turret without getting visual confirmation. The other S&B was about six months old and made a trip to the S&B service center just before coming to me. If I understand this correctly, the scope was sent in for service because the lockers were too tight making them hard to use in cold weather. As a result the feel on the clicks was changed during that service trip to make the adjustments a little lighter. These turrets agreed with me much better, but I still do not like the whole MTC business. I understand the reason for it, but it is not my thing. Every MTC implementation I have seen to date makes “no eyes” operation virtually impossible for me. On the other hand, if I only had one scope to get used to, perhaps it would work better for me. Since a bunch of people out there clearly like MTC, I must be odd, which is not all that surprising. Both S&B scopes I looked at had double turn knobs with a nice tactile pop-up indicator on top of the turret, so you know when you are on the second turn. One thing that I really liked on the S&B turrets was the locking feature. There is a collar that slides up and down and locks the turret in place. It seemed pretty stiff and tightly fitted, so I suspect it is unlikely to get jammed due to dirt and sand too much. That makes any inadvertent setting change unlikely. Also, the way I shoot, I like to use the reticle within 500 yards or so, and switch to knob twisting when the distances get longer (this is somewhat caliber dependent, of course). Similarly, I tend to hold for wind, so I like the idea of being able to lock the windage knob when not in use. If I were to make a recommendation to S&B, I would suggest making the turret adjustment a fair bit lighter, especially since the locking feature is there. Premier turrets are very familiar to me since I have seen quite a few of them over the years. They work well for me, but in this group they are mid-pack in feel. Early Premier scopes had very stiff knobs. Recent scopes are much better calibrated in my opinion, but still a bit on the stiff side. The sample I had here is similar in feel to the better one of the two S&Bs I looked at. This scope also has the MTC feature that gives me some of the same problems I get on the S&B, but the MTC is less pronounced, so it is easier for me to use. The second turn indicator is tactile and is on the bottom of the turret. The way it is positioned, it is harder to see than the indicator on the S&B or Kahles, but a little easier to get my finger on for tactile confirmation. I like it. Toolless turret reset is a nice feature unique to the Premier scopes, but it is not something i care about all that much. Steiner turrets were easily the lightest of the bunch and the mushiest. They were still easy enough to use, but the feel was certainly less crisp than with the other scopes here. Apparently, that was quickly changed since more recent Steiner 5-25×56 scopes that I have seen had notably firmed up clicks. Still, in this group even the most recent Steiner would have the lightest clicks. Second turn indicator is a sleeve that slides up and down the turret and exposes the right markings depending on which turret turn your on. It worked well for me and seemed to be pretty tightly fitted. Still, I have to wonder how it would do with fine sand all over it. I suspect it would do all right, but I did not try to jam it. I did spin the turrets on this scope a lot. I probably spent more time checking tracking on this scope than on the other ones here since this is the newest design in this group. I would be comfortable trusting these adjustments. Other than one hiccup that was unlikely to be scope related, there were no issues. Kahles turrets, overall, were the best of the bunch. The click feel was the most distinct of the “high adjustment per turn” group without being excessively heavy. The second turn indicator is a small pop-up on top of the turret that is both visual and tactile. Aside from the March, this was easily the most comfortable scope for me to use without looking at the turrets. March is somewhat handcuffed by the 5 mil per turn turret, so Kahles wins this by combining good feel with larger adjustment per turn than the March. The one thing I wish Kahles had was a locking turret like the S&B has. Perhaps, I am misguided, but the more I think about (and the more time I spend with different scopes), the more I like the idea of turrets that are either locking or available with covers. 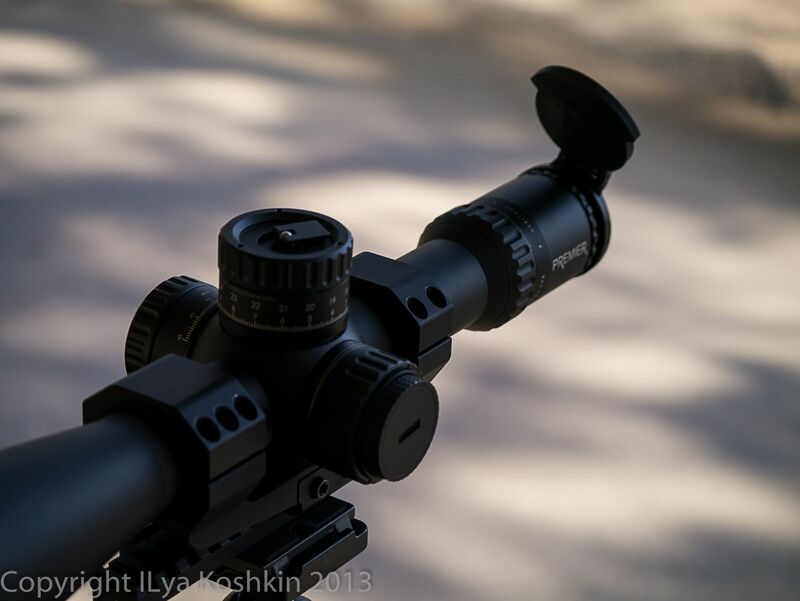 There is no shortage of scopes with well executed reticles and one advantage of having an FFP reticle is that you get more use out of the reticle for both ranging and holding for elevation/wind. I like the idea of locking the turrets and not worrying whether they have accidentally shifted. Ordinarily, parallax adjustment knob does not get its own section, but in this case, Kahles took a different approach to it, so I figured I should give it its due. 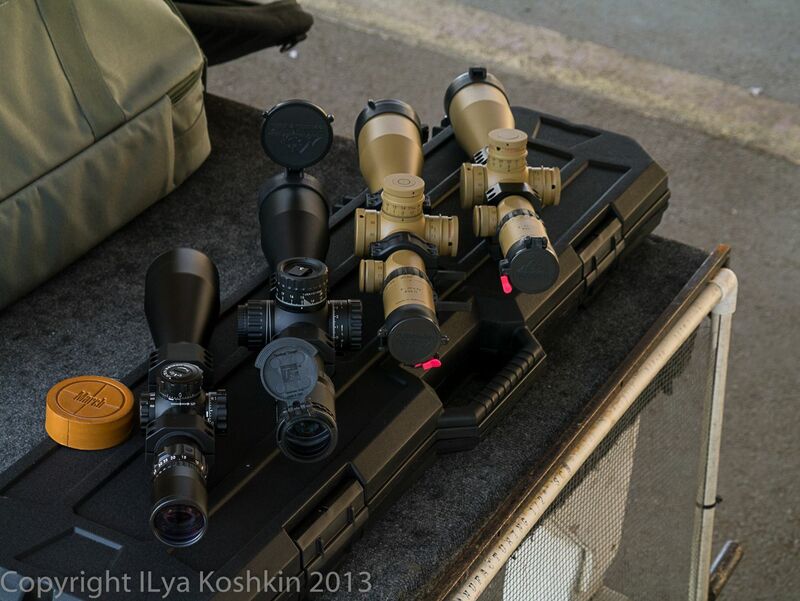 All of these scopes except for the Kahles have somewhat conventional looking side focus knobs. They all work well enough and are, largely, well calibrated. March seemed to have comparatively fast focus adjustment ratio which sometimes gives me problems. However, in this case, it worked well and I have no complaints. Kahles, on the other hand, integrated parallax/image focus adjustment into a large ring on the bottom of the elevation turret. They also added several detents to it, loosely corresponding to target distances in 100 meter increments. I thought both were an interesting twist on parallax control (the detents were also there on their earlier and more conventional looking K312 design) and now that I have spent some time with it, I really like it. The adjustment speed feels comparatively slow, which stands to reason since the adjustment ring’s diameter is pretty large. It is very easy to use with either hand, so southpaws and people who practice shooting both strong and weak side, should give it a try. I do not particularly like numerical scales on parallax adjustment turrets, but I did like the detents. They seemed to help with operating the scope by touch. By knowing, roughly, which detent corresponds to which distance, I could quickly get to the ballpark of where I thought the target was and fine tune from there. I checked all of the scopes for repeatability of parallax adjustment and hysteresis and did not run into any issues with them, excepting the Kahles which I think had a problem specific to this scope. I will talk about that a little more later, but bottom line is that this specific sample seemed to have an issue and plan to do a complete re-test on a different scope. Before I proceed with this, keep in mind that variations in reticle illumination are often due to different reticle designs. Two different reticles in the same scope can have very different illumination effectiveness depending on reticle design. Illumination on the March is a push button built into the side focus knob, with only four adjustment levels, but they seem calibrated well enough for low light use (the low intensity module). An even lower setting could be useful, but what I have seen in the past worked OK. The specific model I tested was not illuminated, but I have a lot of mileage with March illumination modules on their 3-24×42 and 1-8×24 models. It gives up some adjustability for compactness, and so far the compromise has not given me any real problems. They have two illumination modules: high intensity and low intensity, with each having four brightness levels. For high magnification scopes like these, low brightness module is the way to go. Steiner and Premier have rotary illumination controls built into the side-focus knob which makes the knobs pretty bulky. Steiner illumination control has 11 brightness levels with an OFF position between each two settings. The dial is loosely divided in half with the the lowest few setting being very low for night time use and the highest few setting being quite bright for day time use. I like this arrangement and when I was using it I habitually stored the scope with the illumination on the OFF position between day and night settings. From there it was very natural to go up for daytime use and go down for night time use. It is also worth noting that Steiner uses a larger button battery than the more ubiquitous 2032 that every one else uses. Premier illumination control is a clickless rotary knob that you first pull out and then rotate to increase illumination. It is a very flexible system and many companies use something similar, but Steiner’s method is faster to deploy. I also like being able to return to the exact illumination level I had before without starting at the lowest level again. Since Kahles has moved the parallax adjustment onto the elevation turret, their rotary illumination control is fairly compact and easy to grab since it is not integrated into the side focus turret. Aside from that, there is nothing unusual about it. It works well. Kahles has been building illuminated scopes for a long time and they know what they are doing. S&B uses a somewhat unique way of controlling the illumination: on all of their high magnification scopes that utilize side focus, they put a completely separate illumination control turret onto the tube just in front of the magnification ring. It is a good system, but it does limit mounting space a bit. Some one piece mounts are not compatible with S&B scopes because of that. I ran into one, and I am sure there are others out there. Illumination itself seemed well sorted out and gave me no problems whatsoever. All of these scopes only have partial reticle illumination, so when it is really dark, you only have a few features illuminated. What exactly is illuminated varies by reticle. I’ll start off by saying a couple of words about Kahles and why I will not discuss its optics any further. The specific scope I had exhibited some focus and CA issues. What was more telling was that at some (long) distances, I could not get the parallax properly taken out. That implies issues with some internal component placement. I will get my hands on another sample and do a re-test. There are some things I could ascertain, like eye relief flexibility and there, Kahles is excellent. Aside from that, I have to look at other samples of this scope to make conclusions. That leaves Premier, Steiner, S&B and March. Ultimately, image fidelity is a rather subjective measure and how we perceive it is a combination of a great variety of factors, with resolution and contrast being the easiest to ascertain composite measures. With variable scopes, performance changes for different magnifications, so where appropriate I break it up by magnification. One of the things that used to be more common with FFP scopes than it is now is tunnelling at low magnifications. The only scope here that exhibits measurable tunneling is the S&B. It disappears as you raise magnification by the time you get to 6.5x-7x. That stands to reason since S&B is, ultimately, the oldest design in this group. All four scopes I am looking at here are exceptionally good. They all have their strengths and weaknesses, but they are largely apparent when you compare them to each other. Compared to lesser scopes, it hard to find too many faults with these. Please note that I decided to somewhat subjectively break out micro-contrast from contrast for the first time in this article series. Micro-contrast refers to the optic’s ability to render very fine tonal gradations and high resolution. That is one of the performance chracteristics where these scopes are notably better than the “almost-alpha” designs that retail at around $1500-$2000. If you know how to read an MTF curve, think of it as the right hand part of the curve where you are looking at MTF at frequencies barely below Nyquist. This also varies for different colors, so common polychromatic MTF measurements will not always give you this information. The best way to measure this is to use something like Gamma’s sophisticated Eigen source behind a knife edge target for narrow band MTF measurements. Empirically, you can get some idea of this by using an extended macbeth chart or outdoors with careful selection of the scene you look at. With low light performance I look at how they do with no bright lights anywhere near and with bright lights outside of the FOV. The first measure is a somewhat pure consequence of resolution and contrast under simple lighting conditions. The second brings in a lot more stray light and off-axis flare. There are a few different types of flare and several of them are accounted for during low light testing. The only other flare test I do separately is for veiling flare where I look at some sort of a low light target with something bright inside the FOV (the moon for example, or street lights). No real differences between these scopes. Steiner>Premier>S&B=March (I have seen some early samples of the S&B when this scope just came out and I could swear it was less sensitive of eye position than the two recent production scopes I looked at here. I wonder if they made some design changes. Steiner is very forgiving of eye position and that is really one of the strengths of this scope). This was one of the things that I found interesting. Technically, geometric distortion is a type of an aberration, but I found most people think of it as something different, so I mention it separately. When your eye right on the optical axis of the scope all of these scopes show minimal distortion. That is usually the case at higher magnifications where the exit pupil is fairly small and you really pay attention to getting your eye into the right spot behind the eyepiece. However, at lower magnifications, the exit pupil gets bigger, so it is possible to get your eye a bit off axis. Premier and Steiner do not exhibit any particularly odd behaviour when your eye is not positioned optimally, or at least nothing that really stands out. All of the March scopes I have seen including the 5-40×56 show some interesting distortion in the outer 40% of the FOV at low magnifications. As you scan your eye across the exit pupil you see the outer part of the image “flow” with apparent magnification at the edges of the FOV different than in the center. Interestingly, if your parallax is adjusted correctly, the center of the image is unaffected. It is a radially symmetric effect of some sort, that can be somewhat lessened via careful adjustment of the eyepiece, but not eliminated. As you increase the magnification past 10x or so, it disappears. Neither the Premier nor the Steiner have this effect, but surprisingly to me, S&B does. Once again, I do not recall ever seeing it on the early S&B 5-25×56 scopes, so either my memory is faulty, or something in this scope’s design has changed over the years. It disappears somewhere between 10x and 12x. Just to be clear, on both March and S&B this effect is most pronounced when the scope is at low magnification (i.e. large exit pupil) and in bright light (i.e. small eye pupil). Aside from that, I did not find anything particularly unusual in terms of aberrations or distortion. There is a little bit of rectilinear distortion near the edges of the FOV at low magnification, but it does not stand out much. You see it a little better on scopes with wider FOV, but it is corrected pretty well. In the grand scheme of things, I spent this whole article nitpicking. When you get into these price ranges, you kinda have to, because major problems are rare. I like some of these scopes more than others, but I would feel comfortable using any one of them. Here are some thoughts on all of these in no particular order. Everyone’s eye is different. Some people are really keen on high contrast, while others really like resolution. I can swing either way, but naturally I lean toward resolution, so optically March scopes really agree with me. Of the scopes in this group, March is the most polarizing design. It has phenomenal resolution and the largest magnification range in this group. On the other hand, its reticle illumination is workable, but somewhat limited compared to other scopes here. Turret clicks are finer than is typical for scopes like this and adjustment per turn is somewhat small. On the other hand, repeatability and mechanical feel are second to none. Zero stop is easier to set than on any other scope I know of. I like mils, but the scope is also available with ¼ MOA and ⅛ MOA clicks. FML-1 reticle that this scope comes with is the simplest design in this bunch, but it is clean and it works well. I like reticles with floating aiming point and the 0.05mrad aiming dot on this reticle agrees with me. I also like the tapered bars that naturally point you toward the center of the reticle at low magnifications. I never cared about having a lot of magnification available to me. Until I tried this scope. Early in the day, before the ground heats up, I can settle down behind the scope, turn up the magnification and see detail on my targets that I never knew existed. I probably do not need, but I definitely like it. I do not think I have ever seen a 56mm optic that showed me this much detail and I am including spotters in this statement as well. It is not quite as good at low magnification, but not too shabby. 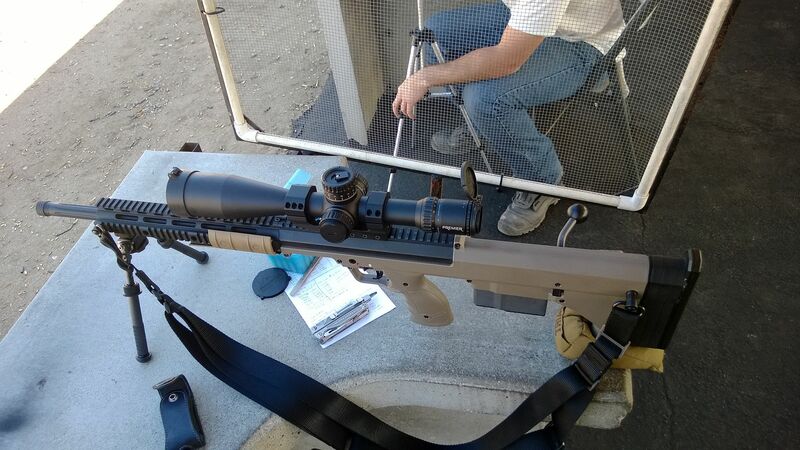 I would like to see a version of this scope with 0.1mrad clicks and 10mrad per turn adjustment though. In some ways, this is the scope by which all other are judged. Having spent some time with it though, I can’t help but wonder if the design is due for a refresh. There isn’t all that much wrong with it, but newer S&B eyepieces seem better. If S&B gets rid of tunneling and makes eye relief a bit more flexible, it will be hard to beat. That having been said, this design has been used all over the world and it practically started this whole type of scopes. At mid-to-high magnification it is spectacular. Locking turrets are a nice touch. Mechanical quality seems to be very good as well. If you are not likely to spend too much time below 10x, this is one of the better options out there. The scopes I looked at had a couple of different reticles. One had a Horus and another was the MSR. I like the MSR reticle and do not care for Horus all that much. I can use Horus reticles after some practice, but there are other grid-type reticle I like more. MSR is a nice reticle. Ultimately, reticle choice is a pretty personal thing and S&B gives you a lot of options. I liked the controls and the unusual parallax adjustment. The optical problems on a sample I saw are very disappointing since I liked the rest of it. 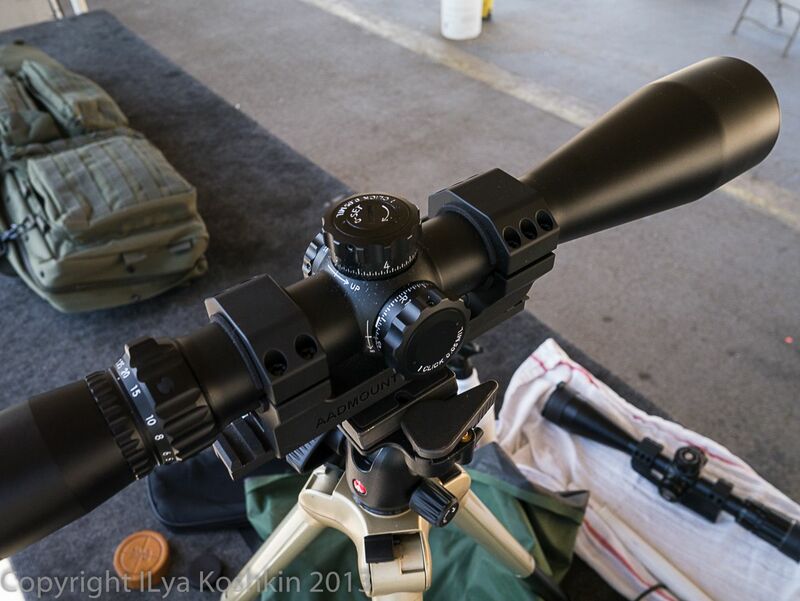 I have seen a lot of Kahles scopes over the years and the optics have always been good, so I am inclined to give Kahles the benefit of the doubt and retest the optics on a different sample. The specific scope I looked at had the Mil 6 reticle which, somewhat unusually, really grew on me as I used it. This is one of my favourite grid-type reticle to date. It works pretty well at low magnifications (one of the major problems of Horus reticles) and at high magnification, the messy part of the reticle is a couple of mils down from the central aiming point, so it does not get in the way if you do not want to use it. The illumination lights up the aiming point and few crosshairs on the horizontal axis, which gives you a nice level reference. It is also available with the MSR (their version has an open center which I like) and a Mil 4 which is kinda like a skeletonized Mil-Dot with a choke style rangefinder. I have seen the last two at SHOT, but never used them. When the scope with the Mil 6 reticle arrived, I was a bit skeptical. I quickly got over that once I did a little shooting with it. Ultimately, I do not have much of a verdict on this Kahles scope. I need to look at another one. Premier scopes had a bit of a rough start, but seemed to have settled down nicely. The company is under new ownership, and I am curious to see how they are going to proceed with making these scopes, but they assured me that the product line will persist. The optical quality of the 5-25×56 is absolutely superb with no real weaknesses that I can see. Mechanically, the sample I have been looking at has also been flawless so far. It is currently sitting on my DTA SRS and I am using it to fine tune handloads for my 6.5x47L. At some point, Paul Lange will politely tell me to get off my fat behind and send it back to him, but I am planning to keep using it until the last moment when I have to pack it up and send it back. 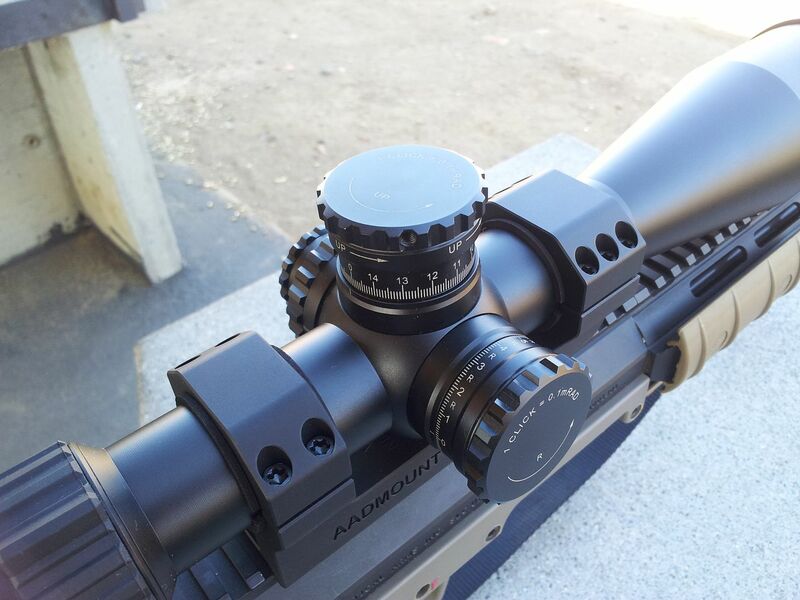 None of the scopes in this group causes all that much of eye fatigue, but Premier offers the most relaxed view in this group across the magnification range. The reticle in this scope is Gen 2 XR, which is a nice match for the magnification range and is one the cleaner “christmas tree” reticle designs out there. It is not quite as simple of a design as March’s FML-1, but it does not get in the way much and I can use it to get a shot off quicker at intermediate range than I can with knob twisting. In terms of all round performance and ease of use this scope is second only to Premier in this group. Where it really stands out is in the flexibility of eye relief. This is a nice eyepiece and it would be very interesting to get it side by side with Kahles and Hensoldt some time. These three offer the most flexible eye position out there. Depth of field on the other hand is quite shallow, if I use the scope for observation, I found myself having to mess with the side focus turret a lot more than I did with S&B or Premier. The flip side of that is the easy of finding perfect focus. With Premier and S&B the depth of field is much greater, so finding perfect image focus takes some paying attention. With Steiner, you know exactly when you are out of focus or in focus. When I was spotting for other people seeing a bullet trace with the Steiner was hard though. I suspect that is also a function of depth of field. I have looked at a different Steiner scope for an earlier article: 4-16×50. The 5-25×56 addresses just about all of the complaints I had with the 4-16×50. Eye relief is just as flexible, but is longer. The black ring around the image is also effectively gone. If there is anything I would change on this scope, it is the turret. It is perfectly functional as is, but I would not mind seeing the same size turret with 10 or 12 mrad per turn adjustment. I suspect it would help with click feel and simplify machining. I did the bulk of the testing of these scopes on two rifles: DTA SRS with a 6.5x47L barrel and an AR chambered for 6.5Grendel. 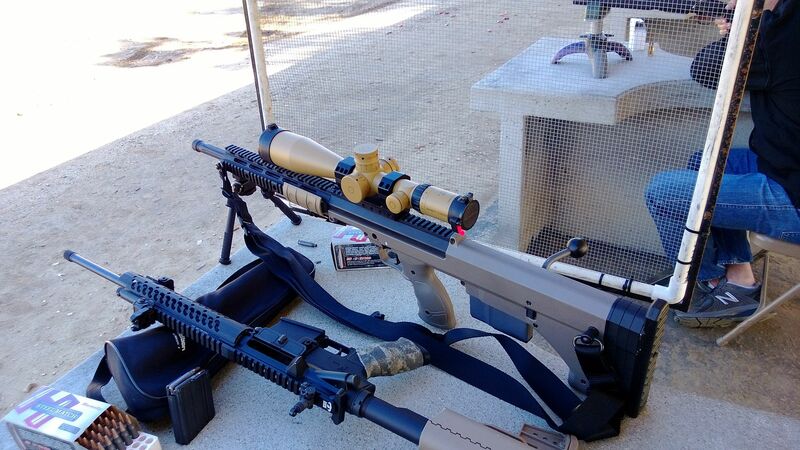 Both rifles are accurate enough for testing scope tracking, although the boltgun is a veritable tack driver. All scopes spent time on both rifles. 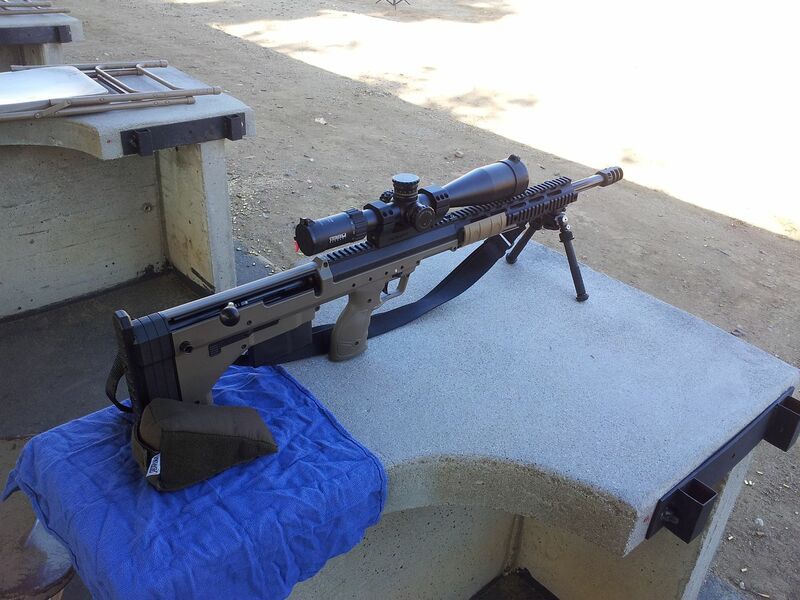 All scopes also spent some time on the DTA with the 338 Lapua barrel. On the Grendel AR which weighs 8.6lbs empty with a sling, these scopes worked a little better, but ultimately they were still grossly oversized. It was OK off the bench and prone, but uncomfortable in any other shooting position. The rifle became too top heavy. On the DTA, however, these scopes are a perfect fit. It is in a completely different weight class. For example, with the heaviest scope of the bunch (Premier) the DTA weighs 17lbs. The weight is mitigated somewhat by the bullpup configuration, but this is still not a weapon that was intended for snap shooting and neither were these scopes. Finally, here is the million dollar question: if I had the money which one of them would I buy? I’ll be damned if I know. The first person to write me a check for three grand will find out.